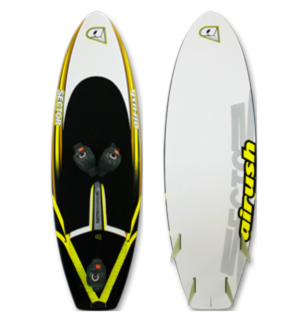 "classic" 60cm width now called "one"
Airush Sector V2 60 Light Wind Session Saver -- Only One Left! Fix your kite with KiteFix for a fraction of the cost of sending it off somewhere to be fixed. I have personally repaired kites that were torn in half and continued using that kite for a full year without a problem. It performs as good as new. We have every KiteFix product in stock. Call or email for our crazy low prices. Too cold for the water but too warm for the snowboard? As a proud sponsor of Kiteboard Milwaukee, we want you to know that even as temperatures drop, kiteboarding is heating up. That's right, the same fronts that bring us these temperature fluctuatations means better wind. So, if you are considering kiteboarding, do not wait until next summer, start now when the wind is good. Then, in winter, put your snowboard or skis on and go out on the snow or frozen lakes. Kiteboarding is a year round sport. Please contact us for information on what equipment is most appropriate for you. We consider your kite experience, local conditions, style of riding, and goals for the sport. Test rides and demonstration equipment are available; actually, it is the best way to learn what you should purchase.